In late August, Gideons in Argentina welcomed an international team of Gideons from South Africa, the United Kingdom, and the USA. For the next week, these brothers in Christ would share copies of God’s Word in the northern city of Cordoba. The international team leader was David Beaty, a Gideon from the USA. “The local Gideons did an excellent job of planning for this event,” says Beaty. Transportation and distribution schedules were thoughtfully organized, helping Gideons carry out the distributions in a timely and efficient manner at schools, hospitals, and jails. Because many distributions take place outdoors, cooperation of the weather is always an extra blessing. The Lord blessed this blitz week with beautiful weather and no rain. By the end of the week, Gideons placed and distributed more than 182,000 copies of God’s Word. During any International Scripture Blitz, prayers are lifted up for the blitz by Gideons, Auxiliary, and friends from around the world. It’s always inspiring to see how the Lord responds to those prayers. One prayer item was for the safety of the blitz team members. 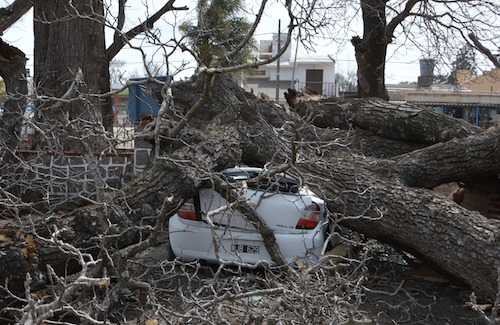 On the last day of distributions, a team of four Gideons parked their car under a big, 200-year-old tree at a military base. For about 45 minutes, some Gideons waited in the parking space while the others consulted with military officials about distributing Scriptures at the base. The Gideons agreed to leave and come back a little later. When they returned less than an hour later, they discovered the tree had split and fallen within minutes after they first left, destroying a car parked in the exact spot where they had been waiting earlier. As Gideons were distributing New Testaments at one college campus, a man approached them and told them he was a Christian. He then revealed he was having some very difficult problems in his marriage. He confessed he was actually thinking of taking his life that very day. One of the Gideons took him aside and reminded him life isn’t always easy, even for followers of Christ, but taking one’s own life is not the solution. He asked the man to pray and trust in the Lord’s divine wisdom to work things out. With tears rolling down the man’s cheeks, he thanked the Gideons and walked away, appearing grateful for the compassion and brotherly advice. 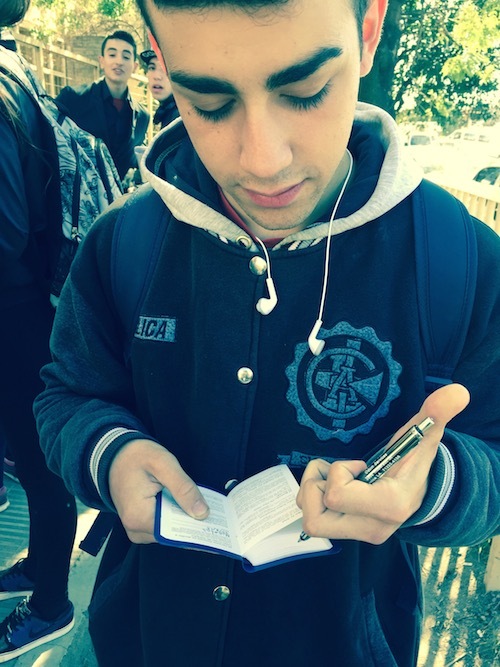 At one high school, a student named Nicolas approached the Gideons and began talking with them. “Do you want to go to heaven?” Tom asked the boy. Tom then led Nicolas in a prayer to receive Jesus as his Lord and Savior. Afterward, Nicolas said he had a habit of cursing and asked if God could help him overcome that. Gideons first organized a camp in Argentina in 1959. 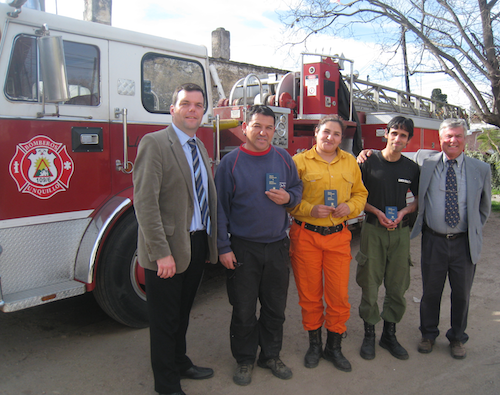 Today, there are 168 Gideon camps in Argentina, and more than 2,000 Gideons and Auxiliary. To date, over 36 million Scriptures have been placed in Argentina through The Gideons International. We thank our members in Argentina as well as the international Gideons who travelled to share copies of God’s Word in this blitz. We also thank the rest of our members and supporters throughout the world whose prayers and financial gifts help make blitzes like this possible. And most of all, we thank our Lord for each and every Scripture distributed during the Argentina blitz. We give Him all the glory and praise for the forthcoming testimonies of lives changed as a result of people receiving those Scriptures. Oh my word!!!! Thank You, thank You, thank You Jesus and thank you Gideons…. God bless your efforts and I ask the Father to not let any turn away but that all will receive and keep growing in the knowledge and grace of Jesus – You Son!!! Praise God from Whom all blessings flow – praise Him all creatures here below – praise Father, Son and Holy Ghost – A M E N!!!! PRAISE BE TO OUR LORD!